The board has a 52 Pin TSSOP 0.5 MM footprint with SOIC footprint, and, with short lead 24 pin TSSOP 0.65 MM footprint. Put most 8 pin amplifiers and fine pitch parts on the large section, going to pads arranged on 0.100" centers. Put on headers to connect to white protoboards or solder onto larger board, or by itself, solder wires, ....its a protoboard...use it! 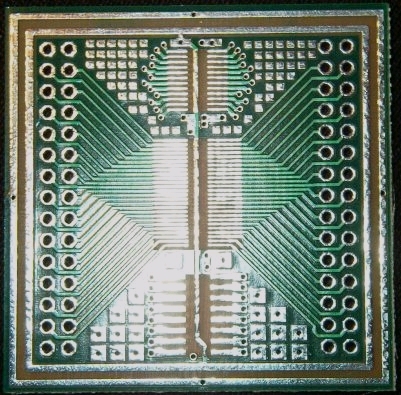 0.5 mm pitch will accept chips as small as MSOP and up to 52 pins worth, or put a bunch of op amps on it. Plenty of room left to build up supporting circuitry on the Proto-Chip SMD wire pads and micro pads. 0603-1206 and SOT's fit, or make your own pads or power busses. Use 28-30 gauge wire, to wire from back or front. See my soldering article, and hone those soldering skills and see the tools used. CHECK YOUR DATA SHEETS for pitch, the distance between the leads, usually the little 'e' measurement! on the end of the data sheets.